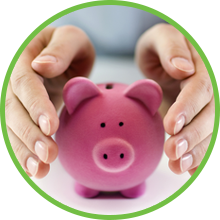 Member savings are called "Shares" because members are owners of the credit union. Share accounts are basic savings accounts. Payroll deductions can be made to any of these accounts before you get your paycheck. Deposits can also be made to share accounts. Deposited checks must be made payable to Fasson Credit Union. Dividends are compounded daily and paid quarterly. Accounts are insured up to $250,000 by the National Credit Union Administration, an agency of the US Government. Certificates of Deposit are term investments available with minimum deposits of $1,000.00. Terms of certificates can vary and certificates pay competitive fixed dividends at maturity.